Blogger ate this post the first time I tried to write it, but I refuse to believe that's a sign, and I'm starting over because you all need to know about my favorite subscription box, Landfall Freight! Just FYI, I subscribe to this beauty myself, with my own money, because I love it. Landfall Freight is a graphic novel subscription box featuring female characters, and a lot of female creators, as well as extras that might appeal to lady types...or anyone. I've received two boxes so far, and getting one of these on the doorstep is just like Christmas. I've found these boxes to be a great value, though one of my two was more of a hit than the other. Paper Girls #1 by Brian K. Vaughan, Cliff Chiang, and Matt Wilson. I've since gone on to subscribe to this comic via Comixology. While I had my doubts, this series is about a "gang" of paper delivery girls who discover a strange machine in the basement. Never Goodnight is a Swedish graphic memoir by Coco Moodysonn about her experience starting a band with her best friends. I'm not too far into this one, but the art is quirky and I like Moodysonn's voice. 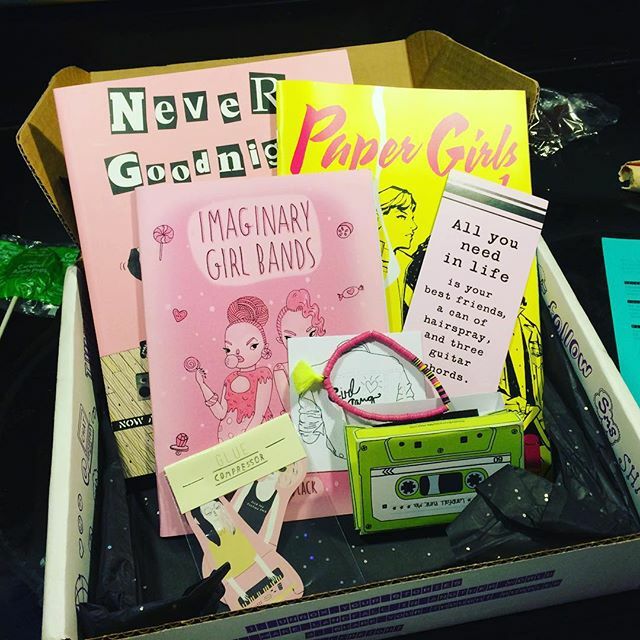 Imaginary Girl Bands is a 'zine by GemmaFleck of Etsy. I haven't read this one yet, but it looks like a fun, fast read. The extras that didn't work so well for me were a cassette tape-shaped box with a vinyl tassel bracelet inside, girl band stickers, and a bookmark (always fine with a bookmark). And don't forget the coveted caramel apple lollipop, which I actually love and look forward to. December's box was squarely up my alley with its dark, magical theme. I even loved the extras in this one. 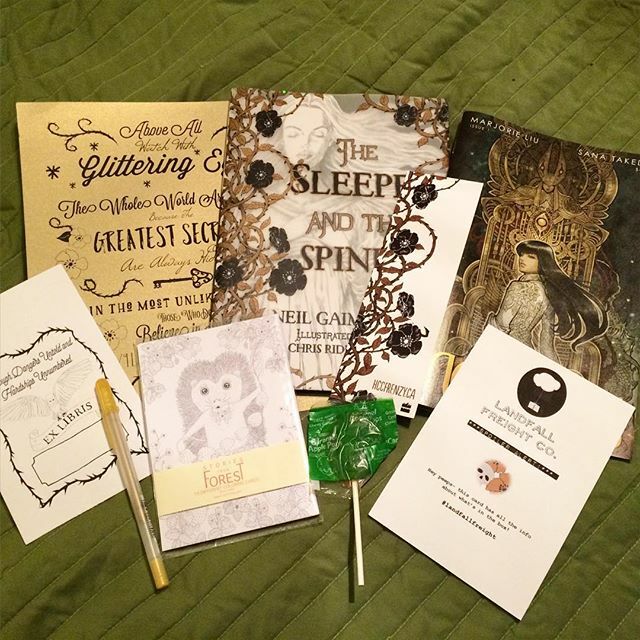 The Sleeper and the Spindle by Neil Gaiman and Chris Riddell. This is a Snow White and Sleeping Beauty fairy tale retelling that I can't wait to dive into. Monstress #1 by Marjorie Liu and Sana Takeda is a dark fantasy series about a young girl with some wicked powers and the people who wish to enslave her. This is a stunning, really long first issue (74 pages), and I rated it 5 stars on Goodreads. I've also subscribed to it on Comixology and will dive into the second issue soon. Extras included a Sleeper and the Spindle bookmark, Stories from the Forest colorable greeting cards, a gold gel pen, and a gold Roald Dahl quote print (suitable for framing!). And...caramel apple lollipop...nom nom! Will I continue to receive this box! Absolutely! I feel like it's a really good value for the $30 price tag, and I like that they include some off-kilter items, smaller presses, and even Etsy sellers. I've definitely found some great comics that I might not have gotten my hands on otherwise, and the extras are unique and fun. Have you ever considered a bookish subscription box? Which one(s)? This is wonderful! I would really like to get into some graphic novels and comics; I have added some ideas to a list for the next readathon, because I feel like that would be a great break from my usual fare. Thanks for sharing this; I'm going to look them up! This looks great! I'd love to subscribe but it's really not worth it for me - it would cost me almost as much in shipping to Australia as for the box itself. I really wish we had things like this here (I guess I could start something myself but you know, effort etc.). I subscribe to Owlcrate's YA box and Book Riot's adult box. I recently thought about Fresh Fiction, but it just wasn't a good fit for me. This one just looks so fun and cute! I have to be really careful because I can easily put myself in the red with all the great bookish boxes out there. Oh, this looks so fun! I'm not sure I need all the extras, but I love that it introduces you to under-the-radar comics and GNs. Also, GEL PENS. I have not had a gel pen in ages and would not say no to a gel pen. Off to investigate whether caramel apple pops actually contain any apple... worst allergy ever. Now here is the first subscription box I'd seriously consider getting. The book ones I'm too nervous about as I'm so picky about my reading, but this looks like a lot of fun and a good way to discover new comics.